Angry Birds Seasons - What Everybody Wants For Christmas From now on, every season is an Angry Birds season. Countdown the 25 days of Christmas with Angry Birds! Frolic in the fun new levels in a snow-filled winter wonderland! Angry Birds Seasons also contains the previously unreleased Halloween Levels! · NEW FROSTY LEVELS! Get in the festive spirit with 25 advent calendar levels - one for each day before Christmas! Plus get 4 bonus levels! · NEW ARCTIC THEME! Take an Arctic Eggspedition and face sub-zero temperatures, large blocks of ice and some rather cold piggies! · Pack your bags for an Arctic Eggspedition with 25 festive, frosty, and fun-filled levels! Plus 4 bonus levels! · 36 all new magical levels! · PORTALS: never-before-seen gameplay that lets you magically transport within the level! · New power-up: AllakaBAM exploding magic box! · Angry Birds Seasons now has power-ups! Check out your old favorites Sling Scope and Super Seed, and get ready for the never-before-seen HOMING BIRD! This hog-seeking hero will head with missile force for the first pig to enter his radar! · PLUS: earn stars and Mighty Eagle feathers to unlock up to EIGHT NEW LEVELS in Winter Wonderham and Haunted Hogs! · Explore a snowy winter landscape under the aurora borealis! · Enjoy 25 new wintry levels, one per day, in this holiday advent calendar! · Slip and slide on the new ice element! · To access each new daily level, you need to have an internet connection enabled. · Explore the scary secrets of the brand new haunted house! · Try to survive 30 all new spooky levels! · Shiver and shake to the ghostly new Halloween music! · Use the brand new ghost bricks for fun trick shots! · A brand new bird. She's cute, pink, and bubbly, but watch out, this girl is no pushover. · Puzzle through 20 brand-new school levels. · Groove to the new theme music in the fun new playground levels. · Spring is finally here, and the Angry Birds are celebrating with a trip to Japan for the Cherry Blossom Festival! Surrounded by beautiful cherry blossoms, it's a perfect time for a picnic lunch with friends and family. But the pigs are trying to have a picnic of their own -- with eggs! Can the Angry Birds save the day? · Puzzle through fifteen head-scratching new levels! · Enjoy the beautiful scenery in the shadow of Mt. Fuji! · Uncover two intriguing bonus levels! · The Angry Birds are celebrating Chinese New Year by chasing after the pigs. The night sky is lighting up -- and it's not just fireworks! · Celebrate with a vibrant red Chinese New Year theme! · 15 challenging levels explode with fireworks and lanterns! · Mighty Eagle transforms into the fearsome Mighty Dragon! · Mighty Dragon available for free in Year of the Dragon episode! · Puzzle your way through 25 new holiday levels! · Enjoy special seasonal surprises! · ALL NEW ORANGE BIRD! · 8 hidden pieces of mooncake to collect, with a special level once you've found them all! · Brand new Summer Pignic Episode! 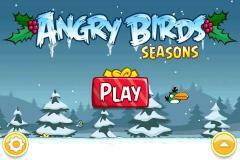 · GO GREEN WITH ANGRY BIRDS SEASONS! · 15 LUCKY GREEN LEVELS! · 2 NEW GOLDEN EGGS AND A ST.PADDY’S DAY SURPRISE! · POTS OF GOLD EVERYWHERE!